Bambino Beach Cabana Tent for Kids. Drop ship 3-5 business days. 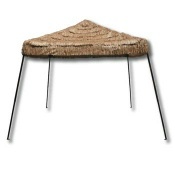 Add this lightweight Beach Umbrella Table to your cabana shade tent order. Add a solid Beach Towel to your Beach Umbrella or Beach Cabana. Go-Zebo Screen room. Drop ship 3-5 business days. InsTent family Beach Cabana. Drop ship 3-5 business days. Instent Beach Cabana. Roomy pop-open sun shelter Beach Cabana. Pops open in seconds! InsTent Family Beach Shade Tent. Limited time only 50% off regular $69.95 price. Family beach sun shelter. Super compact when folded! Mark your shady spot on the beach in style with this festive pop up cabana. Rapido Sun Shelter for Children. Drop ship 3-5 business days. Lightweight aluminum frame beach cabana. Twist n' fold beach sun shelter sets up in seconds.